Fox31 News segment interviewing Beverly Cusick about Thera Togs and showing a success story. Interview with Beverly Cusick Inventor of Thera Togs in an ABC 7 News segment. 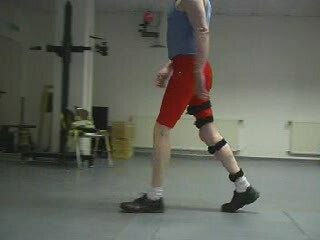 Shows various patient cases where the use of theratogs has a postive impact on their gait. A brief introduction to Thera Togs and their potential. Three Lock Box is a quick disconnect device that can change a KAFO to an AFO in one easy step. 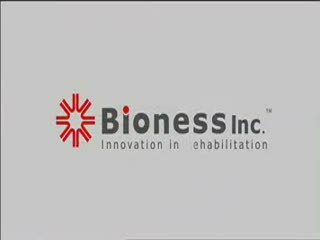 This is a video produced by Bioness showing actual patient testimonials for their experiences with the H200. Excellent video demonstrating an ideal candidate that walks very well with a stance control KAFO with only one upright on the lateral side. 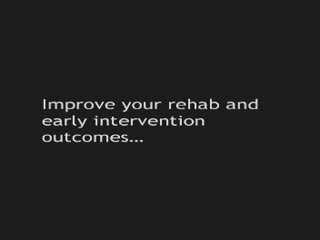 Very lightweight approach to lower limb management. 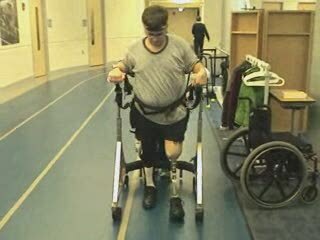 This guy walks quite smoothly on the treadmill with the Otto Bock stance control KAFO (Freewalk). Wow!! 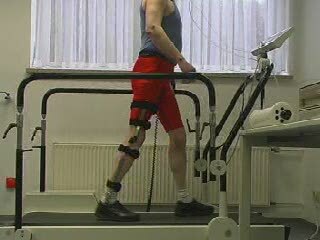 A sensor walk KAFO on the right side and an Above Knee prosthesis on the left side. This guy is doing great!